First Came Fashion: A Little Piece of History. A highlight from my stay at The Plaza Hotel was meeting author, Patty Farmer. 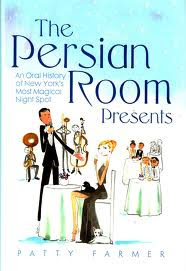 Several months ago, I "met" Ms. Farmer via twitter which is how I learned about her book, The Persian Room Presents: An Oral History of New York's Most Magical Night Spot. Since The Plaza is my favorite place to stay and I love its history, I was thrilled when Ms. Farmer (and her dog, Sabrina) kindly made some time to sit and chat about her life at The Plaza and shared some of hundreds of stories collected of what used to be the place to be - The Persian Room. Dream. Come. True. Labels: New York Fashion Week., New York., The Persian Room Presents.